Starring: Gene Hackman, Williem Defoe, Frances McDormand, R. Lee Ermey, Gailard Sartain, Stephen Tobolowsky, Pruitt Taylor Vince, Michael Rooker, Brad Dourif. 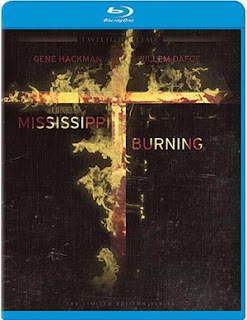 Plot: Product Description: Mississippi Burning (1988) tells the real-life tale of three young Civil Rights workers murdered in deep-South Mississippi, focusing on the FBI agents who arrive to investigate the crime. This is one of those movies I return to often. I have seen this movie so many times, and it never falters in its disturbing truths. This is a film with flawless acting, dynamic direction, and utterly haunting imagery and storytelling. There is a darkness to this film. Its equal parts truth, and equal parts fiction. It adds a disturbing truth of history, and details the horrible reality, and death of three young civil rights workers. A deep south of hate, anger and murder. A deep south of hatred, so thick that it murdered innocence. I am from the south and it pains me to say I know hatred so well. I grew up remembering the Klan holding rallies down town and hearing hatred spewed. It’s shocking to think people have such ignorance that skin color or race matters. This film is often one I recommend to anyone who has not seen it. The dark, atmospheric, small town claustrophobia of Americana, at its darkest time, is filmed with a nightmarish ordeal. Something that is beyond words is the cinematography by Peter Biziou. He captures a darker toned, small time Americana that leaves a storybook setting, yet enters the recesses of criminal history as an image. The film is written in a way that you’re reading a True Crime book. When I heard that Twilight Time Blu-ray was releasing this on Blu-ray I was jumping for joy at the prospect of owning this on a high quality blu-ray finally. They did not let me down. This is everything I could ask for in a High Definition, and beautiful audio blu-ray. This film has never looked like this. Amazing transfer, and something that stands out above and beyond most transfers. I loved this product as much as I love the movie. I think what ultimately stands out the most about this film is the actors. This has some of the greats of cinema embracing this horrible plight of hatred. The god of cinema Gene Hackman needs no introduction. A master talent of old-school and new school perfection. Williem Defoe, lord how I love thee. He is the pure essence of all things cinema. Starring in some of my favorite films of all time, 1985’s To Live and Die in L.A., 1986’s Platoon, the masterpiece 1988’s The Last Temptation of Christ, 1989’s Born on the 4th of July, and many others including this one I am reviewing. He is the pivotal idea of perfection in acting. The amazing award winning Frances McDormand stars, in all her beautiful glory. Always a priceless performer, and the role of Mrs. Pell in Mississippi Burning is no different. The very under appreciated, and over looked master, Brad Dourif. Brad is a constant performer of excellence in the art form of acting. No matter how small, weird or dark a role is, he masters it was ease. R. Lee Ermey, Gailard Sartain, Stephen Tobolowsky, Pruitt Taylor Vince, all four masters in these parts, and in their careers. Also starring the amazing man himself, Michael Rooker. A true performer that never gets the praise and perfection he deserves. I will never forget him as Henry Lee Lucas, in one of the most disturbing films of all time, Henry: Portrait of a Serial Killer. Now as you have read, I mentioned, equal parts truth and equal parts fiction. The film is loosely based on the real life murders of 3 civil rights workers in 1964. The story revolves mainly around the two FBI Agents, Rupert Anderson and Alan Ward, in real life these persona's are based on Agent John Proctor and Agent Joseph Sullivan. The movie changes a lot of the real truths, such as names and also the ability in locating the three bodies. But the story is still based on the real life event, just with many alterations of the real reality. This changing takes nothing away from the story, or film, because the movie, is brilliant in just about everything a movie can be brilliant with. Flawless acting. Flawless directing. Flawless story, cinematography and music score. The whole film is just one of those movies that is brilliant in so many ways. This was nominated for many Academy Awards including Best Picture, Best Director, Best Actor and Best Cinematography, which it won for, and rightly deserved. Possibly one of the best cinematography experiences you will have in cinema. As Roger Ebert stated, it is one of the best films of 1988. I feel it is one of the best films period, and should go on any list of great pieces of cinema. Something that makes this stand out is the writing. Chris Gerolmo wrote a wonderful film. Gerolmo on an interesting note, wrote and directed one of the greatest TV films of all time, Citizen X, which was the true story about the Ukrainian Serial Killer Andrei Chikitilo. He has a wonderful way in telling a haunting story. Mississippi Burning is parts historical, parts fiction and equal parts unrelenting thriller. He was able to capture a perfect American story, and give a tight, haunting, and disturbing piece of backwoods Americana at its darkest. I suppose the director really needs no introduction. Sir Alan William Parker is one of those fantastic directors that leaves a true stamp of mastery on his achievements in film. Directing such greats like, 1978’s Midnight Express, 1987’s Angel Heart, 1999’s Angela’s Ashes. No matter if he is directing musicals like, 1980’s Fame, or 1982’s Pink Floyd: The Wall, he is a prime example of a directing genius. Twilight Time did an amazing Blu-ray transfer. A perfect choice to bring this film to blu-ray. The imagery is vibrant. The darkened moments are crisp, right along with the colored moments. The imagery seems almost new. The clarity of the film has never looked any better. The sound quality is the same. The audio is spot on. There is no flaw in the audio and video department. Isolated Score Track. Amazing feature as always. The music is done by a music master, Trevor Jones. A wonderful composer and conductor in the Film Score reality. He has mastered many great film scores. Trevor Jones music is filled with such amazing emotional depth, that it lingers long after the film. Trevor Jones has done some of the great films in cinema, supplying the original score for 1981’s Excalibur. The unique and odd horror film, 1982’s The Sender. The one and only, amazing, brilliant and pivotal part of my childhood, the spectacular, magical and fantasy weaved, 1982’s The Dark Crystal. The wonderful 1984 mini-series The Last Days of Pompeii. From both small screen, to large screen, he has graced the cinema world with a wonderful array of passionate sounds, music that digs deep into your soul, and mind, and tells you a story. I can sit here and mention movie after movie that he has done, for he is a master talent that bleeds the art-form of crafting a story around his music. His music tells the ultimate emotional understanding of films, and Mississippi Burning is no different. He also has worked on another Alan Parker film, Angel Heart. Audio Commentary with Director Alan Parker. Great to hear the director talk about his film and the history of the movie. Twilight Time aced the video and sound quality. A lovingly crisp, tight and vibrant Blu-ray. Loved everything about this movie, seeing this for the first time on Blu-ray was absolutely amazing. I highly recommend this Blu-ray.